Interesting Facts: Labrador Retrievers are not only the most popular dog in the United States, but in the world. They make ideal pets, rescue dogs, guide dogs, and work dogs. Labs come in three colors: chocolate, black, and yellow. Puppies of different colors can occur in the same litter. Yellow labs vary from white to gold to copper. 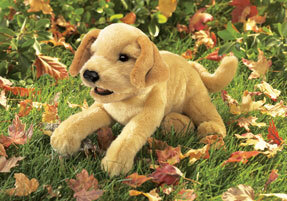 Yellow lab puppies have black noses, which often turn pinkish as they get older. Lab puppies are very energetic until they mature and receive training. They love to dig, play with other animals like cats, and swim.